The tower your cat has been waiting for. Transform the way your cat lives, hunts, and plays. All cats need a space of their own - a well defined, well defended territory - it's a natural part of their wild instincts from which they can spy and hunt. 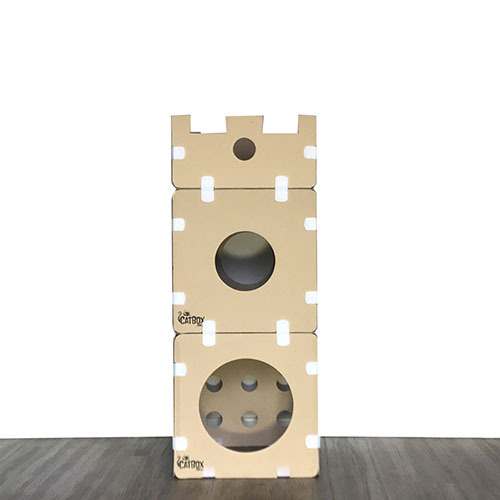 Excite and challenge your cats with peekaboo holes and hidey sections to help keep them active and mentally challenged. Cats with their own space are less stressed, and have somewhere to escape to and feel safe when danger (visitors, loud noises) arrives. 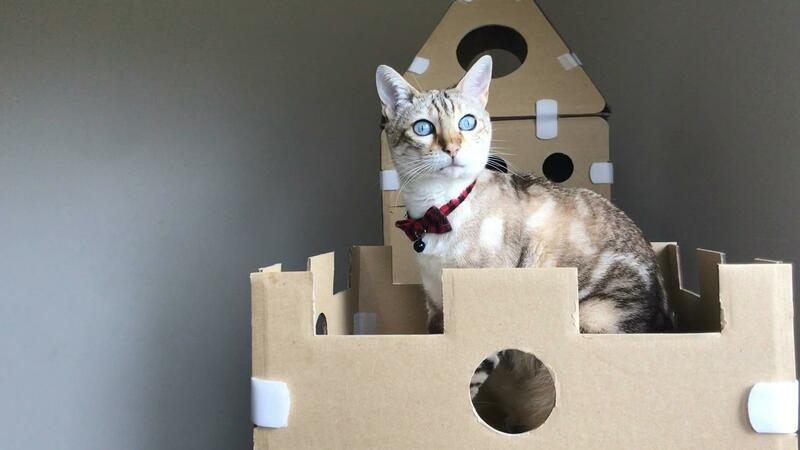 Cats love to survey their area from up high, a tower gives them a vantage point, and a castle lets them rule (without climbing up your furniture). Set up however you want, and join multiple towers together for extra awesome combinations! 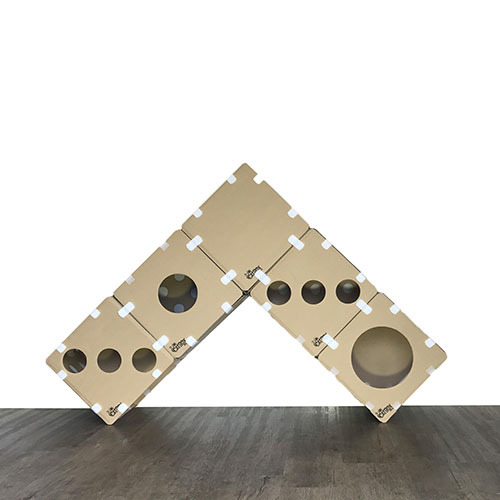 We have created modular cat towers in high quality styling, each one able to be put together to suit you and your cat's needs. Strong high quality cardboard, with kraft texture cats love. Made locally in Australia, from Australian cardboard. Each box has up to 6 sides with different patterns included. Primarily made of cardboard, it is environmentally conscious. We introduce the CatBox cats to a new tower. Any side can go anywhere for complete flexibility. All ceilings include holes so your cats can climb and explore around. Hook and loop connectors make for easy assembly and re-configuration. 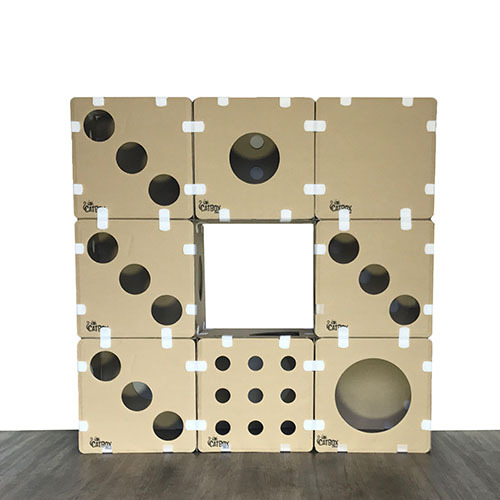 All CatBox modular cardboard products connect to each other easily. With many entrances, windows and lots of peekaboo, it's an entertainment centre. Add towers together and go bigger! Strong - Wall supported ceiling/roof pieces can easily hold the largest of cats, and stand up to rough and tumble antics when your kitties fight for best positioning. 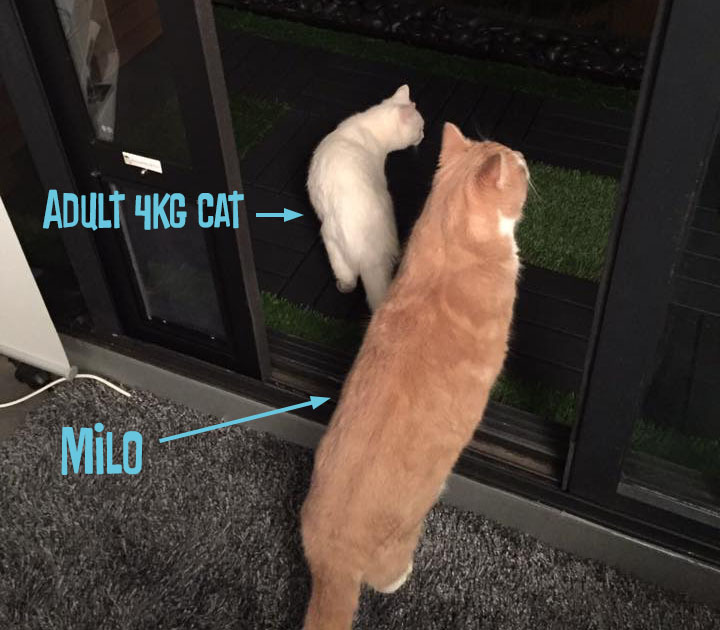 Milo (pictured below) is an 11kg Tom, and put it to the test! Ms Cara Cat just loves her tower. She hops in there and swipes at me as I pass by and loves to swipe at toys dangled around the tower. She spends quite a bit of time in her terrific tower. 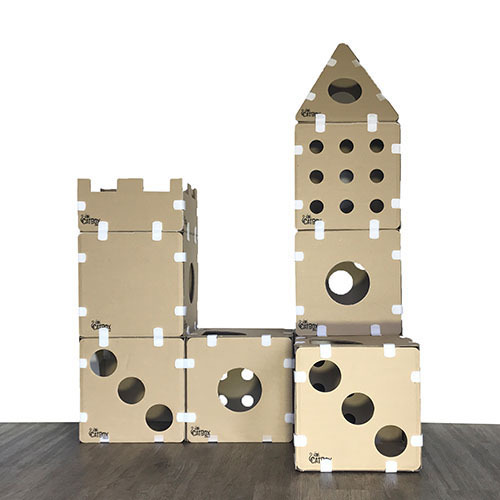 Great versatile castle, the cats love chasing, hiding, sleeping and rubbing their face on it. Stable and strong, however I don't know how well a fat cat would go on the second level [ we do know now thanks to Milo! - ed ]. The endless holes was why I bought it and it has been fantastic during play time with toys and saving your hands from being in the crossfire. Excellent purchase! 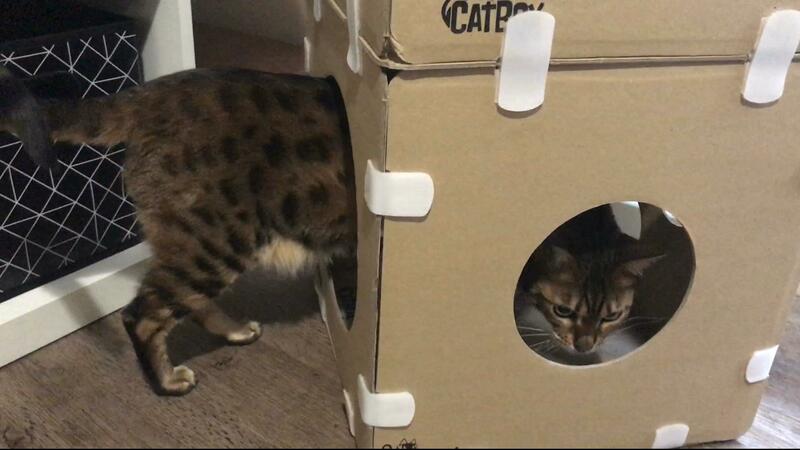 Spoil your cat with an awesome tower by CatBox. Three awesome towers to build a castle, for one outstanding price. 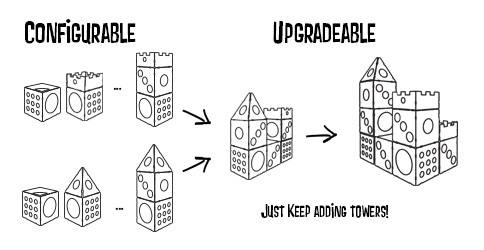 There are 6 unique sides included in each Tower, and 2 of each is provided for a total of 12 modular sides. 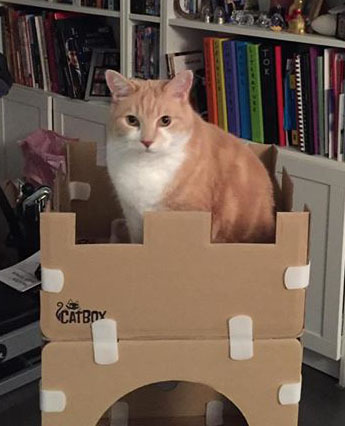 Each castle comes with 3 full towers, allowing you to put them together however you want and go wide or tall, or even split them up into separate towers if your cats do not like sharing! Putting together the towers is a breeze - each modular piece connects to another with hook and loop (it's like velcro), so you can change it up as often as you want, easily and quickly. It all flat-packs right back to its original form if you need to pack up or you move, and a castle flat packs into a stack of approximately 40cm by 40cm! Every Tower comes with a random 'tower/steeple' top, OR the 'rampart' (castley looking thing). Every Castle comes with at least one of each of the 'tower/steeple' tops AND a 'rampart' (the third tower top is random).